Harry S. Truman had been Franklin Delano Roosevelt’s Vice President for only 82 days before Roosevelt died on April 12, 1945. Just weeks after Truman took over the Executive office as the 33rd President of the United States, the Allied forces defeated the Axis Powers and World War II came to an end. May 8 was declared as V-E Day (Victory in Europe Day), which was also Truman’s 61st birthday. He held a press conference announcing the victories in Germany and Italy and the end of World War II. For Christmas that year, he gave each White House staff member a scroll of his speech from the news conference. He also sent out official White House Christmas cards, which featured a litho holly and berries design along with a standard gold imprint. The back of the envelope was also imprinted in gold with the Presidential Seal. For the following Christmas, as a gift to all 575 members of the White House staff, Truman gave an autographed copy of a photograph of him and First Lady Bess boarding the President’s private plane, the Sacred Crow. “Christmas 1946” was etched into the bottom of each photograph. The Trumans also had 800 Christmas cards engraved from Brewood Engravers that featured an etching of a jeweled Christmas candelabra and the following message: “Christmas 1946 A Merry Christmas from The President and Mrs. Truman”. The east Oriental spruce tree on the South Lawn was decorated for the National Community Christmas Tree celebration. After the tree was lit, Truman gave a Christmas greeting broadcasted via radio, asking Americans to “strive with undaunted faith and courage to achieve in the present some measure of that unity with which the Nation’s sons and the sons of our allies went forth to win the war.” That was the first year that the ceremony was televised, but the telecast was not widespread. A television and broadcasting committee was formed for future ceremonies. In 1947, as a Christmas gift to his White House staff, the President gave a maroon faux leather wallet designed to hold identification cards. The front of the wallet contained a gold Presidential Seal along with the following imprint: “MERRY CHRISTMAS from THE PRESIDENT AND MRS. TRUMAN 1947″. As a Christmas gift for his cabinet members, Truman gave a genuine black leather identification billfold wallet. Each billfold contained the recipient’s title along with a gold stamp of the Presidential Seal. Each wallet was presented with a Christmas card from the President and First Lady. For the National Community Christmas Tree ceremony that year, the President asked Americans in his annual speech to “[extend] aid to our less fortunate brothers” with the hope to renew faith “in the dignity of the individuals and the brotherhood of man.” The ceremony was televised by the National Broadcasting Company (NBC) and De Monte Television Company. 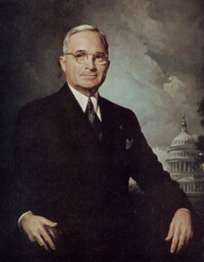 The following year was an election year, and with an approval rating of only 36%, the chances for Truman to remain the President weren’t looking very strong. Taking combative measures to defeat Republican opponent Thomas Dewey, Truman traveled across the country on the Presidential train, making frequent stops to give short speeches from the rear platform. Truman’s campaigning tactic became known as his Whistle Stop Tour, which led him to victoriously securing over 300 electoral votes. That Christmas, the President gifted to 740 members of his White House staff a brown leather bookmark embossed with the Presidential Seal and imprinted with the following message, evoking his sentiments for his next term in office: “I would rather have peace in the world than be President, Christmas Greetings from The President and Mrs. Truman 1948”. During this time, the White House was under renovation and so the First Family took up temporary residence at the Blair House, located at 1651 Pennsylvania Avenue. Wooden scraps from the renovations were used to construct paper weights, which were given as Christmas gifts to the Presidential Cabinet members. For the 1948 National Community Christmas Tree lighting ceremony, 2,100 people arrived on the South Lawn. Truman had left Washington to spend Christmas at home in Independence, Missouri, but he made an audio recording of his Christmas message to the American people, and it was rebroadcasted at the ceremony. For the 1949 Christmas gift to their White House staff (or rather the Blair House staff), the Trumans gave a leather key holder. Each holder contained a snap closure and was imprinted with a brief Christmas greeting. To a small few of the President’s closest executive team members, he gave the same paperweight from the year prior, and to his Cabinet members, he gave the bound book, Selected Speeches and Statements on Foreign Affairs by Harry S. Truman. Truman again went back to his home in Independence before the National Community Christmas Tree lighting ceremony took place. He delivered his Christmas greeting to the American people via radio and television transmissions, telling the public to remember the “thousands and thousands of families homeless, hopeless, destitute, and torn with despair on Christmas Eve.” The ceremony was presided over by Secretary of the Interior Oscar Chapman, who suggested that American children donate toys to the poverty-stricken European youth. On June 25, 1950, the North Korean Army invaded South Korea, triggering the onset of the Korean War. Only five years after the end of World War II, global peace had been disrupted again. For Christmas that year as a gift to his White House staff, the President gave frameable copies of his Christmas Greetings 1950 message, which reflected upon his appreciation for those who whole-heartedly cared for his needs while he tended to the needs of the country. For his Cabinet members, Truman gave a set of six crystal glasses engraved with the Presidential Coat of Arms. With the First Family living in the Blair House since 1948, it had become their Washington D.C. residence while the White House was still being renovated. For Christmas of 1951, the President gave a copy of a photograph taken of the Blair House to each White House staff member. The photograph contained the following message: “Christmas Greetings from the President and Mrs. Truman 1951”. To his Cabinet members and close friends, the President gave a bound copy of his opening address at the Treaty of Peace with Japan conference held in San Francisco on September 8. The east tree was decorated for the National Community Christmas Tree lighting ceremony that year, which Truman lit with a telegraph key from his home in Independence. Being this was the fourth year in a row that the President was not actually present for the national Christmas tree lighting ceremony and attendance was gradually decreasing, the chairman of the committee expressed the need to “rehabilitate” the ceremony. For Christmas of 1952, having decided to not run for re-election, Truman opted to spend his last holiday season as our country’s President in Washington. With renovations to the White House finally complete, the President and First Lady gave to each member of their staff a reproduction of a photograph of the White House. Each reproduction contained a gold Presidential Seal along with the greeting, “Christmas Greetings from the President and Mrs. Truman, 1952”. Harry S. Truman went back to Independence, Missouri in January of 1953 to enjoy a simpler life that didn’t involve the heaviness of politics he experienced while in Washington. I find it strange that Truman spent so many Christmases not in Washington. I guess those were different times. The media nowadays would not likely abide a president phoning in his Christmas tree lighting speech. What impressed me so much about this article were all of the references to CHRISTMAS. Today Truman wouldn;t send Christmas Cards or have a Christmas tree lighting speech. It would have to be a Holiday card or a Holdiay speech. Maybe that’s what’s wrong with our country today: we have taken God out of the equation.